Celebrity chefs have an uncanny ability to take something simple and reinvent it with a signature twist. But recreating those recipes can be close to impossible without the right tips and tools…until now. Macy’s Culinary Council featured chef, Takashi Yagihashi, has taken an American breakfast favorite and put his signature Japanese spin on it. Not only is Chef Yagihashi reinventing your basic waffle, but he’s dressing it up with even more sweet, Japanese-inpsired flavors. Here are all the Asain influences you’ll need to spice up your table at home. 1. Combine water and dark brown sugar in sauce pot. 2. Once dissolved reduce to half. 3. Set waffle iron on high heat. (You will only be using the front 2 waffle wells). 4. Slice Kirimochi to 1/2″ thick slices. 5. Spray waffle iron with nonstick spray. 6. Place 2 slices of Kirimochi in the waffle iron. Sprinkle about 1/2 tsp of chocolate chips on each slice, then place another slice of Kirimochi on top. Close waffle iron (it will not close all the way). 7. Once mochi is soft (about 4-5 minutes) close the waffle iron all the way, continue to cook for about 5-7 minutes. The mochi will be a nice golden brown color and soft and sticky on the inside. Remove from waffle iron. 8. Take the mochi and shape into a square and then cut into triangles. 9. Place the 2 pieces of mochi in the center of the plate. 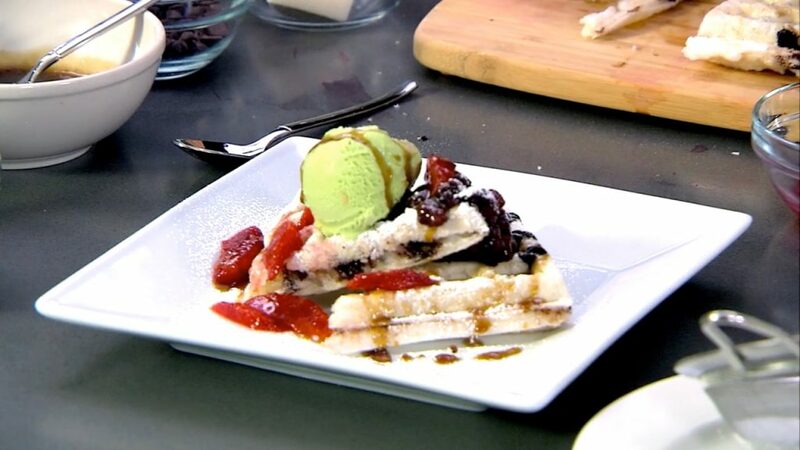 Place a small scoop (2″ diameter) of green tea ice cream on top. Place 1 T of sweetened red bean paste on the ice cream. 10. Garnish with blood orange segments and finish with confectioner’s sugar. Drizzle the plate with the dark brown sugar reduction (about 1 tsp each plate). Ready to get started on Chef Yagihashi’s featured recipe? You can get this Tools of the Trade 13pc Cookware Set, in Stainless Steel or Nonstick, for just $39.99 through April 30. Keep in mind, if you can’t find any of the specialty ingredients, feel free to switch them up with your own flavor profiles. Find this recipe and more at Macy’s Culinary Council.